Inhabit is a Unico demonstration project of modular housing…pretty neat if not a little heavy on the Scandinavian interior design. 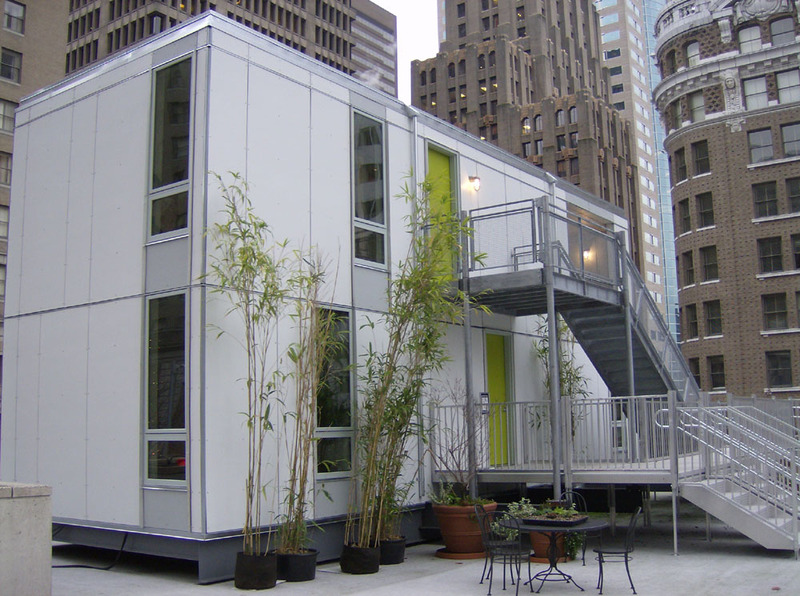 This kind of modular multifamily housing would likely be cheaper than typical multi-family housing, but they did not have any cost estimates when I asked. Advantages listed on their website include less construction time, less neighborhood disruption, sustainable materials, less waste, and flexibility in fitting them on differently configured sites. Apparently the demo was manufactured in Burlington, WA so one could also say these could create jobs in place. Not sure how these would work with ground-floor retail, and may be more appropriate for non-commercial multi-family areas. The models they have inside show them stacked up to 4 units high, and they say they can go as high as 5 stories. As Bucky Fuller asked “Would you have a team of automobile builders/mechanics assemble your car in your driveway? Then why do we build housing on-site, using innumerable imported (to site) components and labor?” or something like that. Posted by MJH on	Tuesday, December 11th, 2007 at 4:42 pm. You can follow any responses to this entry through the RSS 2.0 feed. You can leave a response, or trackback from your own site. Well done, Mithun. Good example of how to do a lot with very little space. A double-wide with a Dwell interior. Sweet! Rumor has it that Unico is eyeing a site(s) in Seattle to stack up a few of these puppies. Tackling the housing affordability crunch in Seattle is going require radical approaches like this. If anyone is selling an apartment building/complex consisting of 150 units or more located in the United States, we may be interested in buying.